Engineering physics is a bridge between pure and applied science, utilizing fundamental concepts in today’s rapidly changing and highly technical engineering environment. An engineering physicist is motivated by the application of science for advancing technology and sustainability. This program enriches you with analytical skills of mathematics and scientific reasoning, technical skills of design, construction and operation of systems including nanotechnology, space instrumentation, particle accelerators and more. You will develop leadership skills as engineering physicists are called to manage projects involving electrical, mechanical or chemical components and tasks. Engineering physicists tend to be versatile and adaptable to projects as they evolve. The undergraduate program presents a challenging and interesting workload. The first two years of classes are based upon core engineering subjects. The third and fourth years of classes are specialized in technical and design-based principles. We offer the advantage of small classes, large lab facilities, superb faculty and excellent support staff. All first year engineering students will take a common set of classes before entering a specialization, such as engineering physics, in their second year. Introduces Special Relativity and the foundations of Quantum Mechanics. Topics in relativity include Lorentz transformations, time dilation, length contraction, space-time diagrams, relativistic addition of velocities, and the relativistic definitions of energy and momentum. Topics in Quantum Mechanics include quantization of energy levels, wave-particle duality and the tunnel effect. This class provides the foundation of geometrical optics for the understanding of complex optics in optical instruments. Topics include image formation, curved optical surfaces, thin and thick lenses, cardinal points and Gaussian optics, apertures, paraxial ray tracing, matrix methods, Fermat's principle and third-order aberrations. Classical instrumentation design is studied including Newtonian and Cassegrain telescopes, astronomical cameras and compound systems. The class concludes with an introduction to ray tracing methods with software packages and techniques for design with realistic computationally difficulty problems. This course takes the students through the entire process of designing and implementing a real space based mission. Space based missions include satellites, rockets and balloons. Emphasis is placed on satellite missions and the design of subsystems to meet mission requirements and specifications. Also included is a detailed discussion of orbital mechanics, spacecraft attitude and pointing, spacecraft propulsion and the launch vehicles required to place the spacecraft into the desired orbit. 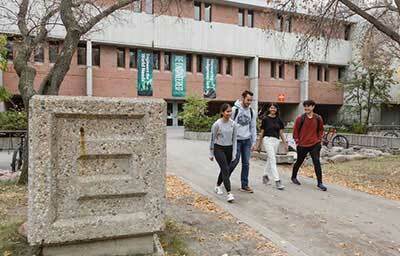 The Department of Physics and Engineering Physics is fully accredited by the Canadian Engineering Accreditation Board. Our outstanding faculty members work hard to give you the best education possible in engineering physics. Your training in engineering physics will give you a special blend of thorough and practical skills that will make you employable in a wide range of careers. You will study principles and design of electronics, energy, optics and lasers, radiation and materials. You’ll be exposed to the modern physics of relativity and quantum mechanics. The U of S is home to the Canadian Light Source synchrotron, Canada’s biggest scientific research project in more than 30 years. The synchrotron is the only facility in Canada using synchrotron light for research and is the fourth most powerful synchrotron in the world. Our program has specializations in areas such as atmospheric and space science, material science and engineering, nuclear energy and plasma science. Students can also work on other specializations with approval from the department. The Engineering Professional Internship Program is a full-time internship opportunity which includes a minimum of eight months of professionally supervised work experience. By participating in an internship, students are able to apply the theoretical knowledge they have acquired during their undergraduate studies in a practical and challenging workplace environment. As an intern you will earn a competitive salary and vacation pay, and may receive a benefits package. You will maintain your full-time student status during your internship. Interns gain practical and in-depth experience within a specialized field, develop strong interpersonal skills, write reports, present seminars and supervise others. These are employable skills that will allow you to better marker yourself in a competitive job market.